The garden hose nozzle sprayer has a container where you can place a cleaning solution while allowing you to use foam or water or both at the same time. You can use it in the garden with multiple spray options. Washing cars, watering plants,lawn , garden, cleaning or bathing your pets, spray nozzle for garden hose fit your different needs. The garden hose nozzle is high pressure industrial design spray distance high up to 6 -10 (m), has pretty good strong water pressure power. Textured comfort grip ergonomic spring trigger and universal base connector comfortable and portable. The extra washer prevents leaks at the point of connection with the hose. No need to keep squeezing the pistol front trigger during spraying, reducing hand ache during longer use, makes watering much easier and far more comfortable. 1. The black adapter under the hand of the spray nozzle could be removed, and it would fit for your standard hose. 2. Please tighten the screw in the middle of the nozzle, if you find it leaks from the bottom of nozzle. HIGH PRESSURE INDUSTRIAL DESIGN: The garden hose nozzle has 8 spray patters and a soap dispenser. New design technology can concentrate water pressure at a point, spray distance up to 6-10 meters. 8 IN 1 SPRAY PATTERNS: The foam gun has 8 types of spouts ,spin- click spray selector different settings ( rinse, stream, flat, center, jet, shower, mist and cone) which can spout water in 8 patterns for different uses, spray nozzle for garden hose fulfill your different needs. Best for Watering Plants, Lawn, Patio, and Washing Car, Showering Pets. BUILD-IN SOAP DISPENSER: The perfect combination of detergent bottle and the soap dispenser, makes you no longer need to prepare a bucket of foamy water separately when washing.You just need to put the detergent into the bottle,adjust the amount of foam by the rotary switch. 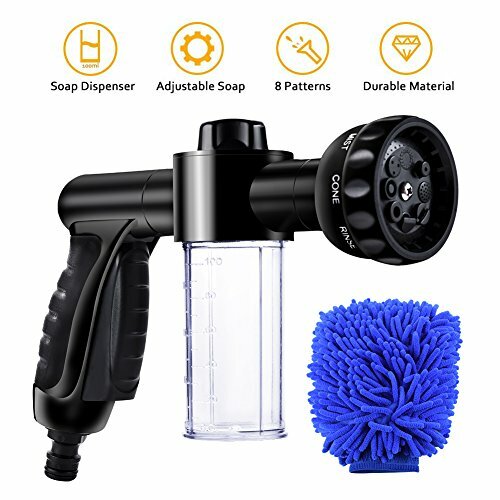 EASY CONNECT: The foam sprayer is made of high-grade rubber, this hose nozzle is easy to grip, slip-resistant and comfortable fit. And it fits any standard size hose, you can easily connect it with your garden hose. HIGH QUALITY CAR WASH GLOVES: To make cars washing more convenient, we provide a premium scratch-free wash mitt for you. Highest density, ultra-soft, double sided, super absorbent. Microfiber strands wipe away grime and provide a swirl-free finish! If you have any questions about this product by EVILTO, contact us by completing and submitting the form below. If you are looking for a specif part number, please include it with your message.